She may have designed her own capsule range for Brit label PPQ, but that doesn’t mean Peaches Geldof gets first dibs on its collection. 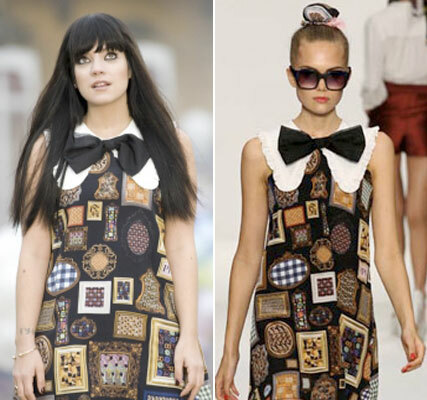 On the front row at the House of Holland show, the socialite stepped out in a distinct bow-necked trapeze dress, which many instantly recognised as the very same dress that Lily Allen wears throughout the video for her number one single, The Fear. So was Peaches trying to grab some Lily style? Well, she clearly tried to put her own spin on the design, wearing it with a black sleeved top, and tying her hair into a high ponytail with what appeared to be a pink scrunchy. Lily, meanwhile, kept her hair long and loose and added some serious designer kudos, with a pair of YSL Tribute pumps completing her look. The jury is out on who wore it best. Let us know your thoughts in the comments box below. Love the style? Buy it here at ASOS!